Nature writing is such an intriguing genre. It’s so quiet and unassuming in its PR that you might not expect it to have such an honorable and long-standing history (Thoreau, Peter Matthiesson, Nan Shephard, Barry Lopez, J. A. Baker) or the capacity to produce extraordinary narratives like Pilgrim at Tinkers Creek by Annie Dillard and Rachel Carson’s Silent Spring. To this day, it’s a powerful form of storytelling still, with contemporary superstars like Robert Macfarlane and Roger Deakin. And yet unlike just about every other storytelling medium – film, television, news media and books – it eschews sensationalism and melodrama. Given that our environment is in the midst of one of the toughest of wars with mankind ever, it could be forgiven for ramping up the drama content, but no, the books I read continue to speak in the most serene of voices. Perhaps that’s precisely the charm. Neil Ansell is the author who got me into nature writing, and so a new book of his is always an event. I know absolutely nothing about nature. I can identify a horse chestnut tree, a willow, a silver birch and probably an oak. I can point out a blackbird and a robin and a pigeon. I have a back garden with some plants in it. That’s it for me. So I never thought I would fall head over heels for the nature genre; but then I read Neil Ansell’s account of living alone in the Welsh countryside for five years, Deep Country, and was bowled over. This is what reading is all about: the invitation into an unknown world made real and vivid and inhabitable by the skill of the writing. When his second book came out, Deer Island, I made sure to secure a review copy and absorbed it in the same kind of trance as before. And now with his third, The Last Wilderness, I tried to hold back a little and understand what it is about his writing that is unique to him, and why I find it so affecting. It’s really hard to put my finger on, but over the course of this review, I’ll try. The Last Wilderness concerns five visits taken over the course of a single year to the Rough Bounds in the Northwest Highlands of Scotland, one of the few places in the British Isles to contain truly ancient wild land, almost untouched by human society. Ansell travelled there first as a young man, just embarking on many years of rootless wandering, and he decided to revisit it now that those years may be coming to an end due to failing health. With each trip he explores a different part of the region, endures the changing seasons, battles his own body and allows the present moment to trigger a rich web of memories drawn from other travels in other times and places. What matters to him throughout his wanderings is the quality of experience. And I also appreciated the attentiveness Ansell pays to his own authentic nature as it is shaped by his environment; the nomadic times in which ‘the shock of the new gives me an intensity of experience, a sudden depth of focus that will perhaps never be replicated’, and the settled times in which extended periods in one place allow him to ‘become gradually aware of how things are more subtle and complex than they first appeared, of how malleable and mutable is the world’. And as a person who can be entirely self-sufficient, there’s an insightful meditation on what it is to be solitary: ‘Empathy is not a zero sum game; caring about nature does not mean you care less about other people.’ The benefits of solitude are to be found in a kind of emptying out of the social ego, leading to a heightened state of sensory arousal, in which the relationship to the external world can strengthen and deepen. If I quote extensively here, it’s because the voice feels so unusual to me in a clamouring, chattering world of rapid and mostly superficial thought. 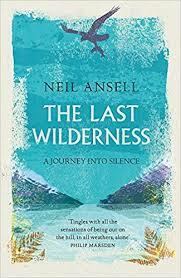 The Last Wilderness charts all manner of loss – loss of the virgin earth, untrodden and unspoiled by mankind, loss of so many species of animals, loss of Ansell’s hearing and loss of his confidence in his personal strength as he begins to suffer from an undiagnosed heart condition. But to my mind, the loss that is most striking, but which is noticeable in this book precisely because it contains so much of it, is loss of a certain state of mind. Ansell is an unusual man. He is solitary and contemplative, accepting and philosophical, non-competitive and non-materialistic, keen on simplicity but not on what is simplistic, and deeply respectful of the land and all it contains. He conjures up so much time in this book, slows down the reader’s mind, and shows us what can be accomplished with a mind that is wide open to everything in the vicinity. That state of mind is as much an endangered species as the mountain gorilla and the Siberian Tiger. Perhaps that’s why inhabiting it in a book feels very precious. Mata Hari must be one of the very few women in history whose name has turned into common terminology, as the spy who seduces to gain knowledge. Though as usual, for every feminist cheer, there’s an eye roll for the patriarchy, as the story surrounding this woman who found transcendent fame remains inseparable from the usual fascination with female sexuality. That Mata Hari was a prostitute with a cause, doesn’t really strike much of a blow for women’s empowerment and emancipation. How then, to tell her story in a 21st century way that honors the complexity of the woman without resorting to the creation of a false archetype of strength and agency as so many historical novels do? How to show both the force of the myth that surrounds her and the genuine desperation that created her? 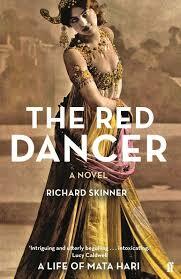 Richard Skinner’s novel, The Red Dancer, offers an intriguing strategy by presenting the reader with a mosaic of fictional witness accounts that all have a perspective on Mata Hari without ever solving her enigma. The novel begins with the placement of a lonely hearts ad in an Amsterdam paper, purporting to come from one MacLeod, a captain in the Dutch army and a notorious womanizer, but really put there as a joke by his mate. The joke, typically, backfires. MacLeod finds himself taking the responses he receives seriously, especially one from a Margaretha Geertruida Zelle (whom he calls Gerda), a pretty, dark-haired woman of great charm and appeal. Macleod knows he’ll be sent out to Indonesia soon and that having a wife would be a good thing. And so they get engaged within six days of meeting, and marry within four months. Then things go horribly wrong. MacLeod is keen on drink and violence, Gerda is a flirt who wants to spend all his money on dresses. They have two children, move to the Dutch East Indies, and drive each other a little bit insane. On their return to Europe, MacLeod deserts Gerda, who heads to Paris and then to Pigalle, the red-light district, recommended to her as a woman with no money and no choices. She finds work as an artist’s model and then as an exotic dancer, a move that will make her name. She claimed to have been born in India, to be related to royalty (both Indian and British), to have studied her dances by way of cults and sacred ritual, to have performed before rajahs, all of which was so much nonsense. But her position, both financially and within society, was a precarious one. Her dancing began to receive poor reviews and, as the First World War loomed, Mata Hari was taken on by the Berlin police intelligence services and used her talents the way she always had. It was, in short, another rackety career, with even less security than she had achieved before, and it ended the way these things inevitably will – in front of a firing squad for treason. It’s a story that changes with the light. In one direction, you can read the masterful ascent of a woman out of poverty and into the annals of history. In another direction you can read the doomed descent of a woman used and abused by men who cared not a jot for her happiness, her health, or her safety. In the middle there’s Gerda herself, whose consciousness we rarely enter in this novel, and who accounts for her actions with only one justification: ‘once she had an impulse, she acted on it quickly.’ Was she a woman of loose morals who believed her own lies? Or a gutsy survivor using the only resource that society cared to place at her disposal – the uncontrollable lust of men? The beautifully written narrative passes through numerous viewpoints, including her bitter husband, the impresario who made her, the journalist who interviews her, her loyal maid, the Russian officer who fell in love with her, the prison doctor, the youngest member of the firing squad. Each account tantalises but cannot solve the mystery. Interspersed with these fictional accounts are the most divisive feature of the narrative: brief non-fiction chapters that explain and describe an extraordinary hotch-potch of cultural artefacts, including the gamelan (a Javanese musical instrument), lithography, absinthe, the Orient Express and the start of the First World War. It’s an audacious strategy that I think is intended to remind the reader of the inescapable history behind the story, and to anchor the fictional accounts in the relics of the times. They add a real taste of the cultural era to the narrative, and accent the dizzying perspective that moves us rapidly between the carapace of Mata Hari’s myth and the reality of the Belle Epoque. But some readers are going to find themselves uncomfortably jarred out of the story when they appear. Overall this is a fascinating account of a historical figure whom we all know without knowing about in the least. The Red Dancer refuses to resolve this problem, preferring to magnify it instead, which is perhaps the truest way of approaching the story of woman who worked myth for all it was worth, until it finally destroyed her. When I began this blog way back in the mists of 2006, I was a proper academic literary critic, which meant that I read books according to a number of non-negotiable rules. I still think they’re pretty good ones, if you want to get the most out of the reading experience. I accepted everything that happened within a story as being necessary to that story. I understood that every scrap of information available about the story was contained within the words of the text, so that in consequence, what the book meant had to be consistent with all I’d been told – there was no place for wild speculations, misplaced prejudices or readings that failed to take account of key elements of the narrative. And I was humble in the face of the story: it was not my place to say, effectively, I wish you were something other/different than you are. My job was to hold the story up to the light to show others all the internal workings, and to mine it for the most interesting things it had to say. Over the course of the blogging years, this process has changed. Slowly, and almost imperceptibly, but to notable effect. Questions that had made no sense to me before – such as ‘Do you like this book?’ and ‘Are you enjoying it?’ – now became much more urgent. I not only recognised that I had certain quirky tastes and hopes for a book, I also gave into them and began to consider them something I should satisfy. And I began to read stories more literally, more superficially, with questions of motivation and plausibility paramount in my mind. In short, the culture of goodreads began to get under my skin, and I let it. 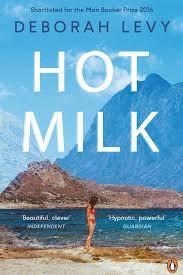 All of which brings us to Deborah Levy’s latest novel, Hot Milk, a book for which I had high (probably unreasonably high) expectations. 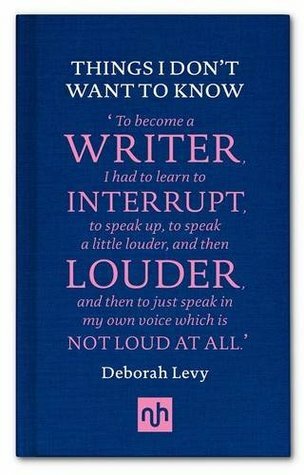 A few years ago, I read Levy’s short memoir, Things I Don’t Want To Know, which was her response to George Orwell’s essay about why he became a writer. I was absolutely blown away by this memoir, which was one of the finest pieces of autobiographical writing I had ever come across, as well as an affecting and sophisticated account of the creative impulse. I hadn’t read any of Levy’s fiction before, and I thought the premise of Hot Milk sounded intriguing. It’s essentially the story of a twisted mother-daughter relationship that has kept Sofia Papastergiadis a slave to her mother’s hypochondriac needs. Rose – whose Greek husband left her long ago – is a stubborn, proud Yorkshire woman who has developed a perplexing condition. Sometimes she can walk, and sometimes she can’t. Having exhausted all other routes of medical inquiry, she and Sofia have come to Southern Spain to the clinic of alternative guru, Dr Gomez, to whom they have paid an astronomical fee in the hope of finding a diagnosis and a cure. Of course, in this land beyond the boundaries of tried and trusted medical science, all might not be as it seems. Dr Gomez is a mercurial trickster, kind and attentive to Rose at one moment, taunting and testing her the next. His approach to Rose’s condition is certainly directed as much towards her controlling nature and her fantasies of victimhood as it is towards laboratory testing. In the meantime, whilst Rose is occupied at the clinic, chronic under-achiever, Sofia, is left to her own devices. Inattentive to her own needs and safety, Sofia manages to get repeatedly stung by jellyfish in the sea and to hook up with a strange couple who live nearby, the potent Ingrid and her boyfriend, Matthew. Through a slightly torturous friendship, Sofia is made to understand her own unquestioning submissiveness and to explore her desires (which include sleeping with both Ingrid and the beach hut attendant who deals with jellyfish stings, Juan). She flies to Athens to meet up with her estranged father and his new wife and child (which doesn’t go particularly well), and she starts to disobey rules and conventions, stealing a fish from the local market and obliging the diving-school owner to unchain his howling dogs. And all of this takes place in a jagged and discontinuous narrative, spiky and surprising in its emotional ups and downs, and often ascerbic in its humour. More than any book I’ve read in a long time, it challenged and complicated the way I was reading and made me wonder what kind of critic I am these days. I found myself looking at it with a kind of odd double vision that was not comfortable. So, for instance, on one of their earlier meetings, Sofia, who has just bought herself a pizza, offers the box to Ingrid. Ingrid frowns at it with contempt, picks up the pizza and throws it on the ground. No one comments on this. Critical reading: Sofia is so downtrodden by her mother that she simply takes this kind of bullying behaviour without batting an eyelid. In fact, she is hypnotized by it, partly because her mother has kept her in place this way for years, partly because such behaviour inevitably contains a repressed part of her self that she can no longer access any other way. Ordinary reading: Who even does that? It is so incredibly rude and impolite and why on earth does Sofia stand for it? Oh no, you are not going to make friends with this person are you, Sofia? For crying out loud, run, run to the hills and never look back! Another instance: Ingrid, who earns money from sewing, gives Sofia a suntop she has made for her, on which is stitched the word Beloved. Sofia gets a certain amount of thrill from this and her low self-esteem is briefly boosted. Until she puts the top in the wash and realises that the word embroidered on it is not as she thought Beloved, but instead, Beheaded. Critical reading: Sofia is so desperate for affection that she projects her need for it out onto the world in an indiscriminate way. What she gets back from the world, however, is emotional violence and hostility, which she often fails to recognise for what it is. Ordinary reading: Why would anyone stitch a word like Beheaded onto an orange silk suntop? (Is Ingrid psychotic?) And how could anyone make such a mistake when reading it? At the very least, our heroine most certainly should have gone to Specsavers. I intended to finish this book, but at some point about the three-quarter mark I put it down and failed to pick it up again. As you may imagine, my feelings about it are conflicted. I think there’s much to be said in its favour. There’s clearly a profound exploration of the mother-daughter relationship going on here, and I also enjoyed straightforwardly the scenes with Rose and Dr Gomez in the clinic. But it just strained my credibility too far in places, and stylistically was too choppy for my personal tastes. Given that my favourite writers are Colette and Willa Cather, everything else is going to have to be perfect for me to put up with choppy prose. But if you can read this book through the lens of artistic critique, then I salute you wholeheartedly and think you’ve got the best chance of making the most of an often intriguing story. 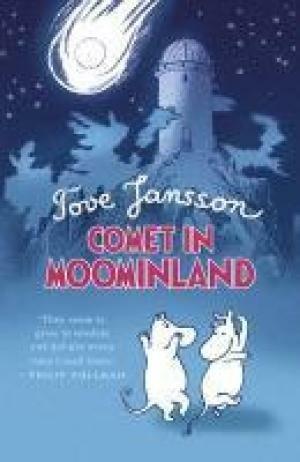 In a bid to remind myself that I still know how to read a book, I recently picked up Comet in Moominland by Tove Jansson. It was short and easy, with pictures. 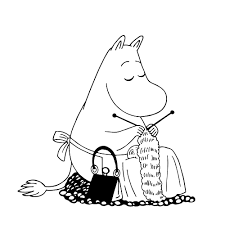 I’m pretty sure I read the Moomin books as a child but I had retained no memory of their intrinsic style, though I was aware that their supporters really love them. I’d only read a few pages in – Moomintroll and Sniff go exploring and find a strange sign, a star with a tail, carved all over the forest – when I became very curious about Moominmamma. When Moomintroll and Sniff finally return from their adventuring, it’s late and past their supper. Moominmamma does not say, ‘Where the hell have you been?’. She does not say ‘I’ve been out of my mind with worry,’ she just says they should help themselves to something to eat before bed. That night when everyone is sleeping, Moominpappa hears a strange noise outside and finds the philosopher Muskrat in the garden in the rain, complaining that the family’s bridge-building activities have destroyed his habitat. Moominpappa invites him in to stay and tries to provide some hospitality by lumbering about in the kitchen without turning the light on. Naturally, he creates a commotion and some breakages. Moominmamma came running downstairs with a candle in her paw. I was so struck by this exchange that I read it out loud to Mr Litlove. ‘Tell me what’s wrong with this scenario,’ I invited him. When on the following day, Moomintroll and Sniff come running in at the sound of the lunch gong, only to demand sandwiches to eat out, and Moominmamma does not say, ‘What? Are you crazy? Go and sit down and eat what I’ve cooked for you,’ but simply complies, I began to believe she was operating under the influence of some powerful sedatives. No, I’m messing with you. I didn’t really believe that, but I was intrigued by this image of overly perfect motherhood, and Moominmamma as this serene, loving, centre of the world whose presence assures comfort, certainty and security. But of course, it’s just as well that she does, because what follows is a delightful tale of environmental apocalypse. The Muskrat informs Moomintroll that the strange signs they keep seeing are indications of the imminent arrival of a comet, an event which will probably destroy the world they live in. 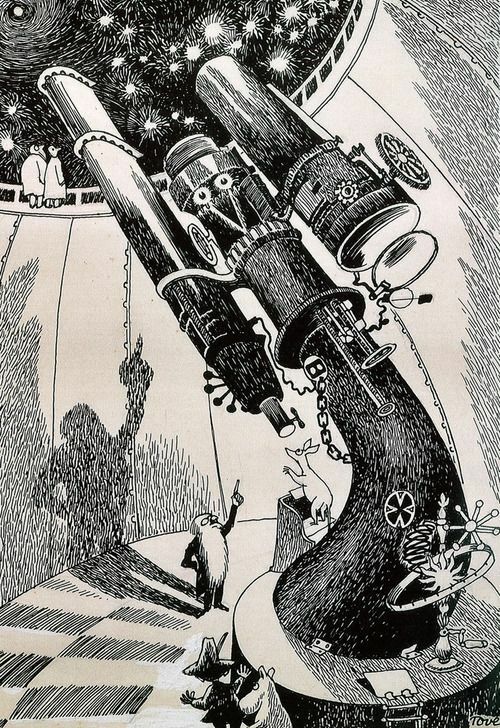 And so Moomintroll decides to take a long and perilous trip to the distant Observatory on the Lonely Mountains where he might get some better information. This being an age in which experts are still respected for their knowledge and no one is running counter-interference on the comet rumour as idle speculation or myth. He and Sniff set out with bags lovingly packed by Moominmamma (whose insistence on including woolen trousers will prove fortuitous) and begin a dangerous, adventure-packed journey, that will find them close to death on many occasions. 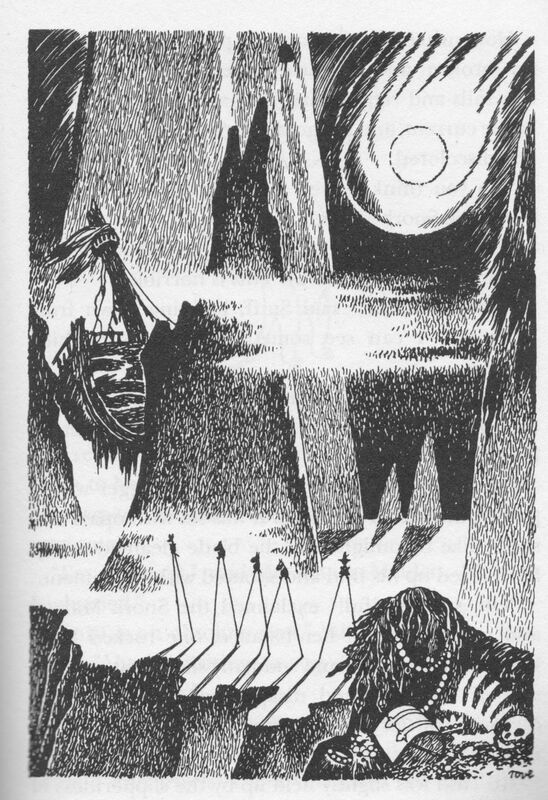 But the journey will also present all kinds of developmental possibilities – Moomintroll falls in love with the Snork Maiden and rescues her, Sniff comes a cropper on a couple of occasions over his desire for all that twinkles, but learns nothing, alas – and will bring them a number of useful travelling companions. They will team up with the experienced and wise Snuffkin, with the analytical Snork, and the sweet, courageous Snork Maiden. The news from the Observatory is bad: the comet is due to strike on the 8th October at 8.42pm and four seconds. The friends hurry back home to the Moomin Valley, but as they go, so the comet comes nearer and nearer, blocking out the sun, drying up the seas and rivers, and generally causing all kinds of climate change mayhem. What matters is teamwork. The friends work together to overcome obstacles, evade dangers and make it back home. Their perspective is entirely inclusive – even the morose transgender Hemulen is rescued by them (though in all fairness, his bad temper is partly due to the fact they ruin his dress by using it as a balloon to out-fly a tornado). They make it back in time to warn the parents and pack up the home, taking their belongings to a nearby cave. Even Moominmamma wigs out a bit at this point, which shows you quite how stressful an approaching apocalypse must be. But as they await the end of the world together, the comet zooms through the valley, missing the earth by inches, and hurtles back out into the wilderness of space. So what are we to learn from this story? The internal moral works this way: if you are close to a loving mother, you will be safe from harm. Moominmamma – or even just the thought of Moominmamma – looms large over this tale, the guarantor of peace and security. For it’s the generosity and affectionate, open inclusiveness of the Moomins that sees them through. Together they are stronger, and that togetherness is based on an explicit diversity of species. All those differences bring with them other essential forms of knowledge and resource. Compassion and wisdom avert oblivion. It occurred to me that in our contemporary world we look to science and technology to save us, and to give us what fragile security we have. But is this wise? In the story, science is impressively informative. The comet really does pass the earth at 8.42pm and four seconds. But that all important sense of safety can only be gained from the community, and one founded on the ideal of the loving mother. The story is a myth. Mothers don’t need to be as perfect in reality as Moominmamma is. But what we do need is that ideal of love in our hearts and minds, because it gives courage and it neutralises fear. It’s the only way to face whatever lies ahead and maybe, just maybe, avoid disaster.